In this June 9, 2015 file photo, former House Speaker Dennis Hastert leaves the federal courthouse in Chicago. 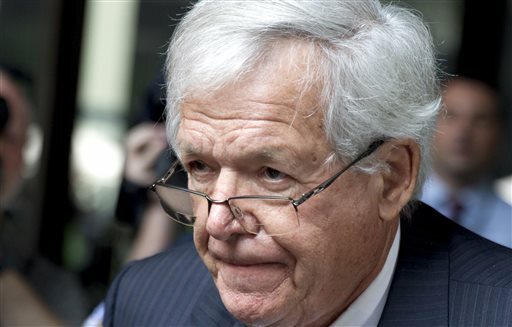 A deadline for Hastert’s legal team to file pretrial paperwork passed with nothing new filed, suggesting the former House speaker could be close to a plea deal that would avert a trial and help keep details of the hush-money case secret, legal experts said Wednesday, Oct. 14, 2015. Former House Speaker Dennis Hastert is expected to plead guilty later this month to charges that he agreed to pay $3.5 million to cover up allegations of misconduct and then lied about it to authorities, according to his lawyers. Reporting from outside the federal courthouse in Chicago, NPR&apos;s Cheryl Corley tells our Newscast unit that the alleged wrongdoing "occurred decades ago when Hastert was a history teacher and a coach at Yorkville High School about 50 miles southwest of Chicago." Cheryl reports that a plea agreement would allow Hastert to avoid a trial. The lawyers, who appeared before a U.S. District Court judge in Chicago, say their client will enter a formal guilty plea on Oct. 28. "Both sides appeared at 9 a.m. before U.S. District Judge Thomas Durkin. "Durkin set Oct. 28 for Hastert to enter the guilty plea. A written plea agreement has been worked out and will be handed over to the judge on Monday, attorneys said in court Thursday. "The plea negotiations were revealed in a hearing late last month when John Gallo, one of Hastert&apos;s attorneys, said the defense had been discussing with federal prosecutors a possible resolution to the case short of a trial — a signal to a possible guilty plea. At the time, Gallo called the talks &apos;productive.&apos; "
"He is accused of structuring the withdrawal of $952,000 in cash in increments just under $10,000 in what prosecutors say was an effort to avoid attracting the attention of federal authorities. The money was allegedly paid to an unidentified person in compensation for &apos;prior misconduct&apos; by Hastert, according to the indictment. "When asked about the withdrawals, Hastert allegedly lied to the FBI about the reason for making them." The Republican lawmaker was speaker of the House for eight years after his predecessor, Newt Gingrich, was forced to step down.